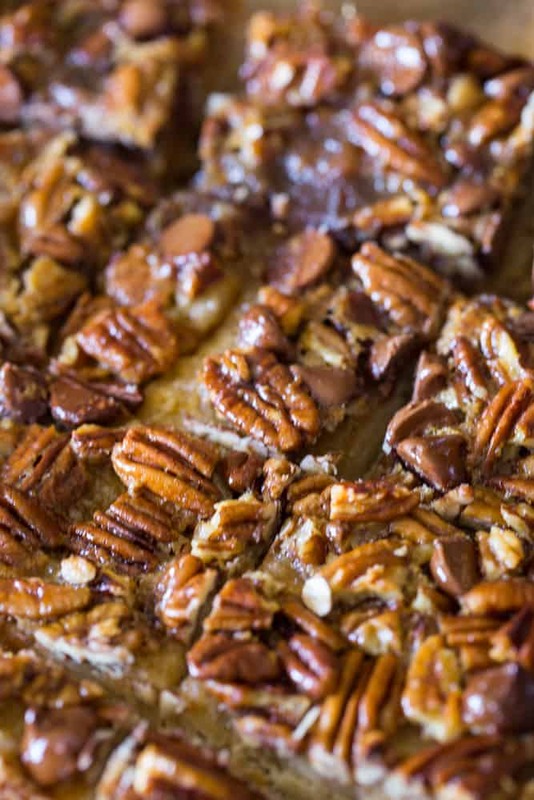 These chewy Chocolate Pecan Pie Bars are the perfect addition to your Thanksgiving table this year. 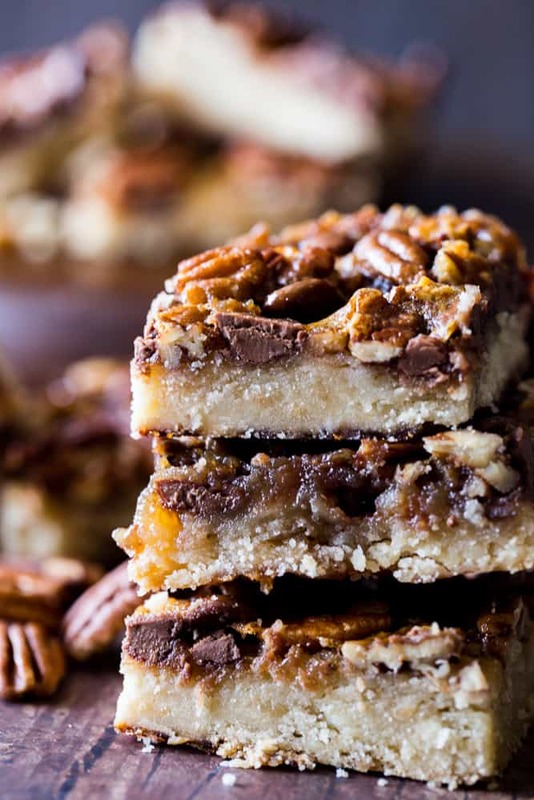 If you like Pecan pie, you will absolutely love these delectable Chocolate Pecan Pie Bars. I don’t know about you, but when I make a holiday meal, whether it is Thanksgiving dinner or Christmas brunch, I want to ensure there is plenty to go around — not just at the meal itself, but to have as leftovers the next day, and the day after that, and the day after that. 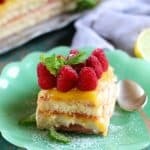 That’s why I love desserts in bar form. 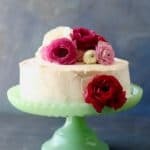 I can double or even triple up the recipe and know there will be more than enough to go around. 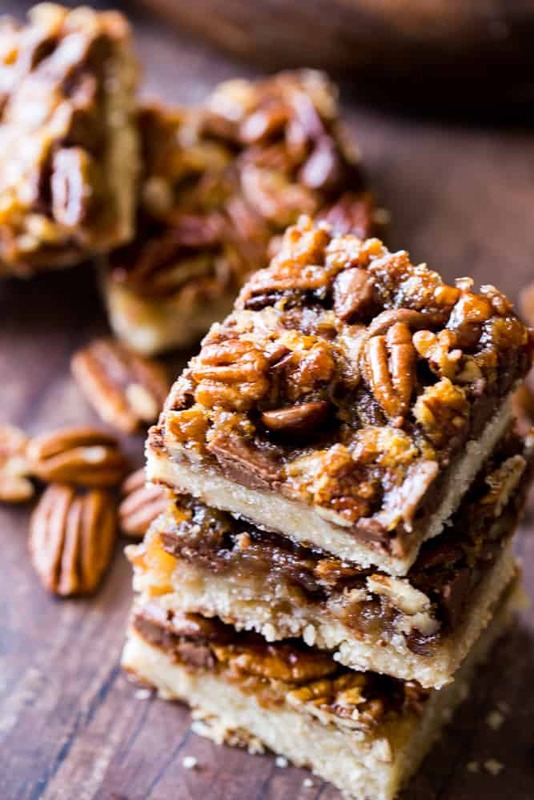 Serving up delicious Chocolate Pecan Pie Bars makes it easy for all my holiday guests to go back for seconds (and thirds) and storing them for later is a breeze. And this recipe comes together quickly, so it’s just the thing to whip up when you get that last minute holiday party invitation. Combining the beloved holiday flavor of pecan pie with rich chocolate and a buttery shortbread crust makes for a truly delectable, indulgent and irresistible treat. You can make them ahead and freeze. 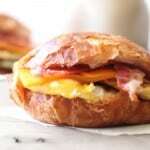 Make a batch (or two), then wrap well and and keep in the freezer for up to three months. Simply let them thaw in the fridge before serving. 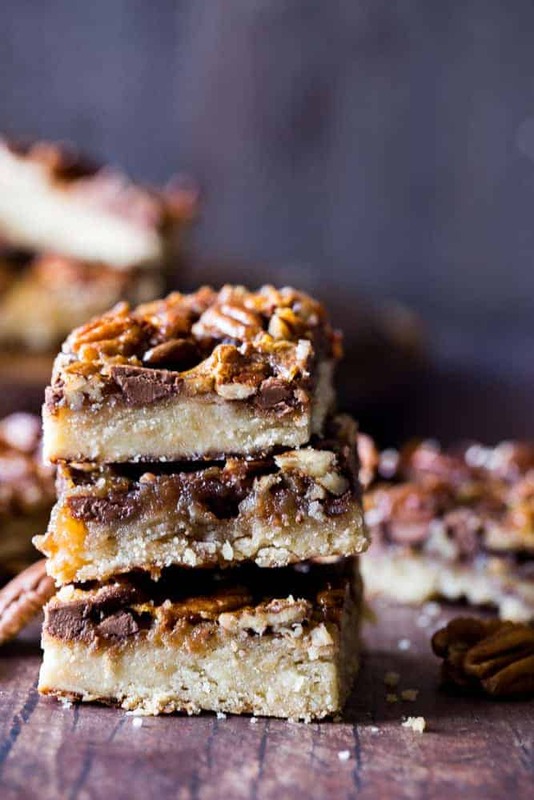 To make an adults-only version of these delicious bars, add 3-4 tablespoons of bourbon to the filling mixture. 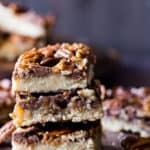 If you like this recipe for Chocolate Pecan Pie Bars, you’ll want to try my Crunchy Chocolate Caramel Bars and Brown Sugar Shortbread Bars. Preheat oven to 350 degrees. Line a 9x9 inch square baking pan with foil and lightly spray with non-stick cooking spray. In a medium sized bowl, combine flour, sugar, and salt. Cut cold butter into the flour mixture with a pastry cutter until mixture is crumbly. Press crust mixture into the bottom of the prepared pan. Bake until edges are golden colored, about 15-17 minutes. Remove from oven and set aside to cool slightly while making the filling. In a large bowl, mix eggs, corn syrup, granulated sugar, and melted butter until well combined. Add chocolate chips and pecans; spread over crust. Bake for 30 minutes, then carefully remove foil. Bake for an additional 30 minutes or until filling has set. 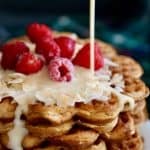 Place pan on a wire rack to cool. Cool completely before cutting into 9-12 squares.